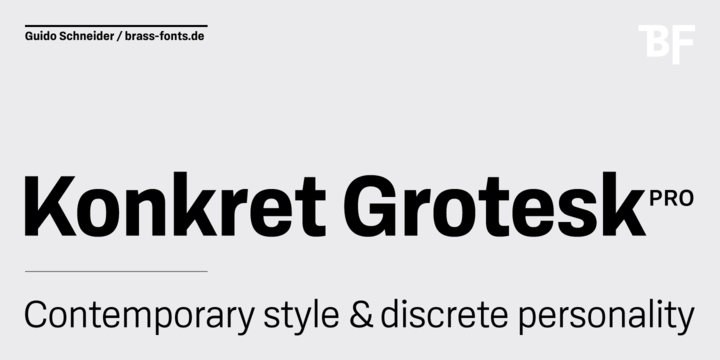 BF Konkret Grotesk Pro a sans serif typeface created by Guido Schneider and published by Brass Fonts which is available in 16 styles, 8 weights (from Thin to Black) with accompanying italics and over 200 language support. Each font has over 1500 glyphs, 7 Figure Sets for all applications, style sets offer more variability. This contemporary typeface is perfect for editorial use, logo, packaging, poster etc. Enjoy another Grotesk font! Styles: Normal, SC, Thin, XLight, Light, Regular, Book, Medium, Bold, XBold, Black, Italics. A font description published on Monday, June 4th, 2018 in Brass Fonts, Fonts, Guido Schneider by Alexandra that has 1,649 views.